WØEA Blog! : Burning down the house! I ran by HRO after work yesterday and picked up the 2kw gas tube for my Alpha Delta lightning protection in anticipation of firing up my SB200 for the big IARU contest this weekend. The little amp has not been powered up since we moved from Iowa and I was a little apprehensive about turning it on again for the first time. Luckily my fears were unfounded because it fired right up without any issue. So I went out to inspect and it only took a moment to see what had happened. This wire was attached to the bottom of the 20m element on the antenna, dangling between the spreaders for the 40m radial loop. Apparently this little bitty stuff (and its insulation) can't handle a few hundred watts while touching other metal parts! The insulation had burned off and caused the 20m element to short out to the 40m element. I'm lucky I didn't burn anything else up! 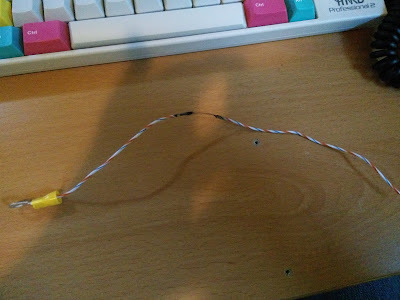 I replaced the wire with some much, much heavier stuff with nice thick insulation and rotated the loop a bit so it fell evenly between 2 spreaders, maximizing the space between them. It shouldn't happen again but I'm going to look into a more sturdy solution that doesn't rely on a flexible wire. With that all fixed up, the amp was showing me 400w out on 20 and 40, just in time for the 0300z CW Ops mini CWT. I ran most of the time and walked away with 52 contacts, mostly on 40. I've been really happy with this antenna on 40m. I still have those 527b tubes I got at Hamcom last year I'd like to throw in and test so I may do a little post on that tonight or tomorrow if I remember. So I guess the station is primed and ready for the big contest this weekend. I hope to hear you all on the air!